Originally uploaded by Bassoon Man. 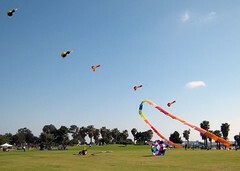 After the week from Hell, I was overjoyed to learn that the San Diego Kite Club was having their monthly fly today (Saturday) and decided that I just had to go. In honor of the event, I finished my flock of ducks (Yes, I really did make them myself – heck, I even used a sewing machine) and brought them to the event! Actually, I’ve got one more duckling to make (the ugly one, of course), but that won’t be too difficult. In addition to the flock, I also brought the bol I had made as my second project. Anyway, the drive to San Diego was rather miserable today – Interstate 5 was a parking lot from Oceanside to Rancho Santa Fe. Why traffic was so bad, I really don’t know but it wasn’t too fun sitting there. Once I got through that mess, it was clear sailing (no pun intended) to Mission Bay. When I arrived, the sky was filled with all kinds of cool kites – lots of deltas, a few gazillion Revs (I brought mine but didn’t fly it), various types of things that would spin in the wind, and even the arch pictured in this photo. Of course, seeing all of the kites made the drive worth it. I immediately connected with Dave (the person I have to blame for my kite addiction) and his wife, Iris. We spent the afternoon flying, watching all of the various kites, and chatting. Both Dave and Iris are fascinating to speak with as they can fill me in on all sorts of kite related information. There was one delta, in particular, that had a very long tube tail. Every time the kite would move in a circle, the tail would mimic the kite so that the tail almost appeared as if it were a corkscrew – very cool! Another group of eleven people practiced flying their Rev 1.5’s – it would have been fun to join them but then again, there are only so many hours in a day – and only so many kites that one can fly at once! I ended the afternoon by finally getting my remote-controlled KAP (kite aerial photography) rig launched. The winds weren’t too strong and I had to get a bigger kite up as a lifter. Even so, the flight was a success. Of course, that doesn’t mean I got any good photos – the fact that my rig went up was all I was after. I’ll post photos from that later. After spending the afternoon at Mission Bay, I had the pleasure of having dinner with Dave and Iris where we chatted about all sorts of things (especially kites). Looking forward to the next time! Be sure to double click on the photo for this post to see other pictures that were taken today.